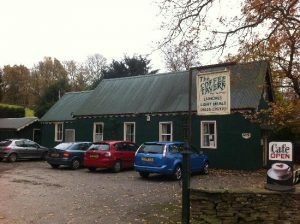 The Coffee Tavern isn’t in Bollington, but for those walkers in the area of Pott Shrigley and Lyme Park, it is a usefully located cafe. Found on Shrigley Road (the road from Pott Shrigley to Higher Poynton), The Coffee Tavern is a genuine curiosity. Built in 1887 to celebrate Queen Victoria’s Golden Jubilee and originally a lending library, this charming café was transformed into its current guise around the turn of the century. It has seating for about 30 diners and offers a range of hearty meals, with a selection of specials chalked up on a large board. Open hours: Open every day apart from Tuesday, 10am to 6pm. Food: Hot drinks, cakes, hearty meals. Licensed to sell wines and beers. Finding it: By car, drive through Pott Shrigley and past the entrance to Shrigley Hall Hotel. Take the next road on the right (Shrigley Road). After less than a mile, the Coffee Tavern is on the right.